1 What if a public entity claims "historical building status" as a reason for not bringing primary use areas (e.g., courtroom galleries where the plaintiff/defendant/jurors/witnesses sit) into compliance? 2 Does a single riser in a doorway connecting 2 levels (e.g. courtroom well to witness stand/clerk station or witness stand/clerk station up to the judge's bench) constitute a stair? 3 Is a ramp or a permanent lift required to access all the different levels of each court room space to include the judge's bench, clerk, witness stand, jury box, etc? 4 In detainee cells equipped with anti-ligature features, grab bars are exempt from being accessible. However, if grab bars are installed anyway, do they still need to comply with the 2010 ADA Standards? 5 In the courtroom gallery, how is the seating capacity calculated within a pew-style bench which provides no separation for each seating space? 6 In the courtroom gallery, when wheelchairs spaces are provided at the end of the pew-style bench, how can the proper egress for other audience members still be provided? 7 Is a turning space required inside a detainee box where a detainee is never allowed independent access or maneuverability within the box? 8 Security officers rarely allow certain detainees with disabilities (people using a wheeled mobility device such as a walker/wheelchair/powerchair or people using a white cane) in group cells with fear that mobility devices or canes become “weaponized” by the detainee(s). Due to this security concern, when group and single cells are provided in a courthouse, can only the single cells be made accessible? 9 Is there a minimum number of accessible routes and entrances into the court building? Does it have to be the main entrance, or is a side entrance acceptable? 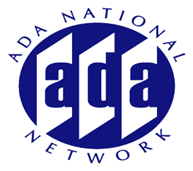 10 Please review aspects of an ADA compliant jury room. 11 When encountering a non-accessible courtroom, or an accessibility challenge, to whom do you address this issue? Time after time we have been given the run around for these types of accessibility issues and it seems we always end up having to call the US Access Board for clarification and end up talking to the same person in the courthouse where we started and they say, oh yeah, guess I should have just answered your question to begin with. Why is compliance so difficult? 12 Do ADA requirements now extend to employee spaces as well as public, even if there isn't an immediate need for an employee to have handicap access? 13 Because the weight of the courtroom entrance door is significantly heavier (for security purposes) and makes it non-compliant for other standards (ADA), how is this addressed in "program access" situations. 14 In "historical building" status facilities, can freight elevators be used to transport prisoners in wheelchairs?